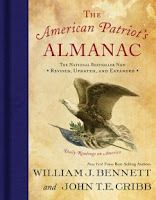 twice is nice: "The American Patriot's Almanac: Daily Readings on America"
"The American Patriot's Almanac: Daily Readings on America"
"The American Patriot's Almanac" is a very impressive treasure of a book. If you are proud to be an American, and you love reading/learning/loving History, then I would highly recommend reading this great find! The outside of the book is beautifully bound in hardback and the pages are intentionally given an antique/rustic look. I loved reading the Preface of the book, which shared the authors opinions, and some quotes from several famous Americans, including Barack Obama and Abraham Lincoln about our great country. I loved how the authors said, "The American solider is the greatest friend of freedom the world has known" (Page xii). My father is currently serving in the military in the Army Special Forces, and I couldn't be more proud of him. Every time I read a piece of American history I think of him - and this book is such an inspiration to our armed forces. We owe everything to them - without them we would not have a country to call our own! This book does such a remarkable job of embracing thier (the military's) gift to the American people. The content of the book is set up sort of like a calendar...starting with January 1st and ending with December 31st. Each page focuses on one event in American history, and then at the bottom of each page there are between 4 and 6 other events that took place on that day throughout time. Also throughout the dated event pages, there are excerpts that focus on the flags in the USA, famous quotes, important holidays, the Declaration of Independence, the Constitution, American poetry, and more. I have to say one of my favorite parts of the books was the list of the Fifty All-American Movies (pages 103 -114). I would love to say that I have seen them all, but that will be added on my list of things to do :) Here are just a few that are listed that I have seen: "Driving Miss Daisy", "Field of Dreams", "Forrest Gump", "Independence Day", "Miracle on 34th Street", "The Music Man", "Rocky", "The Princess & the Frog" & "Saving Private Ryan". The back of the book, lists facts about all of the 50 states in our country (in alphabetical order), including the state flag, motto, & symbols. Of course I was curious about my home state, Missouri...its the 17th most populous state & our state musical instrument is the fiddle! Very neat! Once you finish the state facts, the authors listed their aknowledgements & then lastly an index for the reader. This book is such a remarkable treasure that any, and every proud American should have in thier library. I learned so much about famous quotes, inventors, events, movies, our government, poetry, women, men & more! I could see this book in every classroom, for all ages & every home, young and old. You will learn something new, and embrace what you may or may not know about the country you have citizenship in. I can't wait to share this book with my family and friends - for I know they will love it just as much as I did! Thank You so much Book Sneeze for letting me be apart of your program! I am looking forward to reading more books in the future!